Kaveman - Seattle Comfortable but sloppy build "I just got the helmet and it fits super well, the padding is soft and secure. I also love the ratchet enclosure. But when I opened it, the back plastic piece for the exit vents was hanging halfway off, and there is something rattling around inside the helmet that I cannot get out. 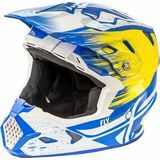 The visor also fogs up instantly when you have it closed." coop - yucca valley,ca nice looking and light. 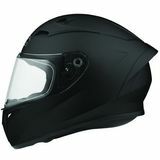 "Great looking helmet, nice and light at a very good price."